(L-R) Me, Cess, Julie, Chats, Salen, Feng, and Cookie. Frances is not in this photo.Thanks to Cookie for this shot! Yesterday, Ralph and I had the chance to be part of a fun play date with my fellow mommy bloggers and their kids. Although the weather did not cooperate that much, the timing of the play date was perfect. It was Ralph's last day of exams and playing in ActiveFun was a great way for him to relax. We braved the rains yesterday and rode the MRT to SM North EDSA. It felt exciting riding the train again with Rap. I think it's good for him to experience commuting once in a while to make him street smart. I guess he has learned a lot during the trip and our uber long walk from the North EDSA station to SM North but that would be for another post. Our kids were allowed to enjoy the play place for two hours. 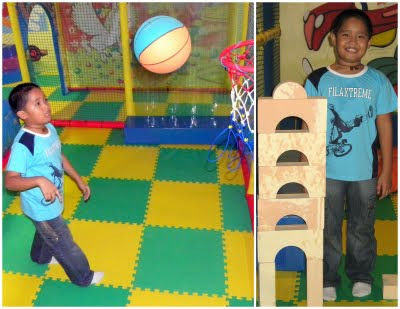 The mommies with smaller kids were also able to play inside the play area with their kids. Even if I am allowed to be there, I guess, Ralph won't still allow me to come and play. This boy of mine is trying hard to project that he's already big. The funny thing was, when a kid pushed the tower of blocks that he made, he ran to me crying and making sumbong. I gave him the look and he just wailed louder! Haha! ActiveFun takes pride in having the longest indoor slides in the Philippines. Aside from the slides, the kids can run around the play area and engage in various activities. Ralph kept himself busy playing basketball and building his tower of sponge blocks. There's also the trampoline and the pool of plastic balls that's always a hit with the kids. Basketball shot courtesy of Cookie. The play place is also the best place to celebrate your parties. They have packages available for a party of 10 to 40 kids. 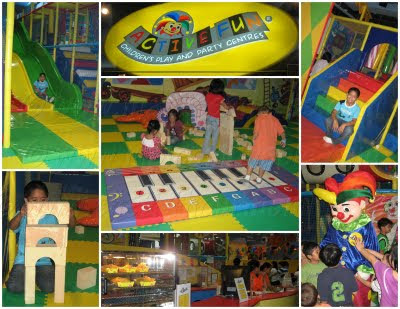 All packages include exclusive use of the party venue for 3 hours, invitations, nametags, loot bags, kiddie meals, ActiveFun cake, ActiveFun Banner, ice cream, and unlimited play. The bigger packages include more freebies. Parties can be held daily at 10 a.m. to 1 p.m., 2 p.m. to 5 p.m., and 6 p.m. to 9 p.m.
ActiveFun SM North EDSA can be found at the 3rd Floor of the SM North Annex. For inquiries and reservations, you can call 215-9891 or 556-1223 or you can visit their site. @Julie: Oo nga, ang saya. Sana talaga may next time para mas maging close ang mga bagets niyo at ang binata ko. Mahiyain kasi ito. Wow, nice venue for kids party nga. Para naman maiba, di lang lagi sa Jollibee. It was nice to see you and Ralph there. Super nag enjoy ang boy ko dun. Hi Mauie! It was so much fun! Nakakatuwa naman si rap re-the tower hehehehehe.